It's Tuesday and that means it's time for another AiFactory challenge on the challenge blog! YAY! This week we are giving away the adorable Sweet Bugs in the Garden set. All the design team members will be using this set so you'll get lots of inspiration. This week, I'm issuing the challenge and it's a special one. We are making cards for Kate who is a sweet little girl that was recently diagnosed with cancer. You can read her story HERE. Along with our challenge, if you send your card into the cards for Kate drive you can win prizes from Jennifer McGuire and her friends. You can read about that drive HERE. I made another digi card this week. I couldn't really get it how I wanted being that this was rather emotional card for me. 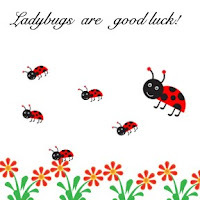 My grandfather who recently passed away used to always say that ladybugs are good luck. He and Miko (his wife) believed this. When my Grandpa had a stroke about 10 years ago, a friend came by with a ladybug magnet for good luck. That day, he started getting better. Soon after, Miko filled his room with ladybug items and not too long after that, he was home and better. Every time he got sick, I used to send him ladybugs for good luck and they always came through for me. So, that's the story behind my card. I know it's super simple. It's a 4 inch square digi card. You can print out your digi cards and mail them just like a regular card OR you can send them to your friends and family via email which is pretty cool too. Please play along with us! You'll be doing a kind gesture for this family and you can be entered to win a lot of prizes. Entries are due on the challenge blog post HERE by next Monday Sept 14 by midnight. I will pick a winner for the adorable digi set and post it on the blog next Tues. This is adorable and Kate will love all these ladybugs. What a sweet story and a beautiful card! I love this, so sweet and adorable. What a great card, Ashley! And I love your story as well! I never knew I could make a digital card! COOL!!!! Ladybirds always remind me of my grandfather, too. i love the sstory behind your card amd tje card itself is so sweet.